Award winning film director and producer Dilip Biswas is no longer in our midst. Biswas passed away at Bumrungrad hospital in Bangkok on July 12. He was suffering from prostate cancer. He was 60 at the time of his demise. Biswas worked in different fields of cinema: As playback singer, actor, director and producer. He entered into the film arena as a playback singer in Zahir Raihan's film Behula. He earned fame as a singer in Anowara, Momer Alo, Dui Bhai, Alomati, Sontan, Chena Achena. He emerged as actor in Habur Biye. Later, he stepped into direction as an assistant director through Agun Niye Khela. His first directorial venture, Samadhi was an immense success. Other well known films are Dabi, Bandhu, Asami, Anurodh, Jinjir, Anarkali, Angshidar, Apaman, Ashwikar, Apeksha, and Ajante. Biswas bagged National Awards thrice as best director. 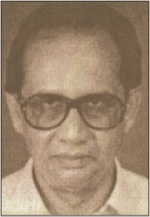 He also produced popular films such as Akritagga, Shasurbari Zindabad and others.